The following is a post by DC EcoWomen boardmember Alison Alford. I recently attended a fantastic DC EcoWomen EcoHour on environmental toxins and their effects on your body. I was spell-bound as Heather White, Executive Director of the Environmental Working Group, told us that EWG preformed a study on ten Americans and found levels of harmful chemicals in their blood, including BPA, mercury, phthalates, and triclosan. EWG knew that these toxins didn’t come from the air, water, soil, or food, because the ten blood donors were newborns. Toxins are showing up everywhere – in our cleaning products, produce, cosmetics and sunscreens, and they are flushed down the drain and polluting our rivers and oceans. Fortunately for us and our children, there are numerous resources to use when trying to find the best product to clean, cook, or consume. Heather advised us that knowledge is indeed power – and that our voices are the best weapon to protect us from chemicals in every day products. Once we educate ourselves on toxins in the environment, we need to speak up, and to speak up often. Write a letter to your member of Congress to let them know that you will no longer accept toxins in your sunscreen and cleaning products. Sign a petition to stand up to pesticide lobbyists. Show your support with your wallet by purchasing environmentally-friendly cosmetics, produce, and cleaning products. But, most importantly, become educated on the dangers of toxins in the environment – because then you will know how to keep those toxins out of your body! Want to read about the right things to put in your body? Check out our post on nutrition and malnutrition in women. The following is a post by DC Ecowomen Board Member Rebecca Aicher. 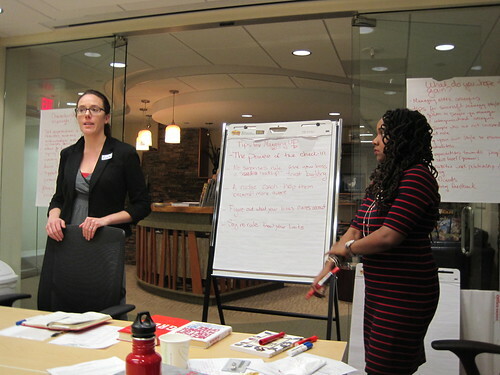 Recently, I was fortunate to attend the DC EcoWomen workshop entitled “How to Be a Successful Woman Manager.” This workshop was led by three impressive women: Elizabeth Wallace; Danielle Moodie-Mills; and Greta Bagwell from the National Wildlife Federation. Elizabeth, Danielle, and Greta emphasized that being a successful manager is not a man versus woman dynamic; rather, management is about flexibility, self-reflection, and respect. Elizabeth, Danielle, and Greta began the workshop by asking all of us what we value in managers, and we generated a long and varied list. In addition, we talked about the less desirable characteristics of managers. Both lists highlighted a common thread; we are a multi-generational, diverse workforce with many weaknesses and a myriad of strengths. In order to play on those strengths, successful managers are able to support the myriad of personalities through trust, respect, and honesty. Elizabeth, Greta, and Danielle provided a plethora of wonderful advice. Just to highlight a few pieces, Elizabeth shared her love of reading through providing an annotated list of recommended books about being a leader, good communicator, and successful manager. Danielle shared her experiences working across generational lines, and gave us some entertaining and insightful advice on how to appreciate the Baby Boomers, Generation Xers, and Millenials-we all have something to contribute! Elizabeth said she hoped that they planted numerous “seeds” that we will use throughout our careers, and I am confident those seeds have already begun to grow. I am looking forward to reading many of Elizabeth’s book suggestions, including Quiet: The Power of Introverts in a World That Can’t Stop Talking. Now, I am using my weekly check-ins with my boss to outline new opportunities. And thanks to Danielle, I appreciate the unsolicited advice I receive from my intergenerational co-workers. I can say with confidence that my professional experience has been enriched from Elizabeth’s, Danielle’s, and Greta’s advice and insight. For more tips on how to get ahead in your career, check out our Resources page! I’ve been to many rallies, but the feeling of protesting in my own backyard is still unreal. The ‘Forward on Climate’ Rally was well organized and well attended, with more than 40,000 in attendance. I was especially impressed that Reverend Yearwood was able to control a crowd of 40,000 despite the cold. I also loved the inclusion and prominence of the Native American speakers on the panel. The female speakers talked about their connection with nature, a consciousness also felt by early explorers and settlers but rarely remembered in our current materialistic society. I was reminded of the power of Mother Nature and that as inhabitants of the Earth, we should protect our land from greedy corporate interests. While I was taking photos, I could feel the energy and commitment of the crowd and I knew I was among friends, our voices echoing strongly in front of the National Monument. Some had traveled for hours on buses to get to the rally and not only did they make the long journey to Washington D.C., but they also brought detailed signs, flags, costumes, hats, and other personalized items with strong climate messages. I loved photographing the event, from the fast-moving clouds overhead to the passionate climate change posters to the march towards the White House. It was a powerful experience to capture the shared sense of urgency and camaraderie from thousands gathered in one place to fight climate deniers and to protect our planet for future generations. “Forward on Climate” – What Are They Protesting About? posted by Cassidy Pillow | Comments Off on “Forward on Climate” – What Are They Protesting About? The day before President’s Day, a reported 50,000 people spent hours in the frigid cold, rallying, yelling, and dancing on the National Mall. Some were in polar bear suits, and many more in polar bear hats. Billed as the largest climate rally in U.S. history, “Forward on Climate” saw attendees of all ages from at least 35 different states. They all gathered to protest the Keystone XL Pipeline, and the extraction of tar sands oil. The organizers of the protest have declared the Keystone XL Pipeline to be the fuse to the world’s largest “carbon bomb.” Tar sands oil extraction is one of the most energy intensive and inefficient ways of extracting energy, producing 3-6 times the greenhouse gas emissions as conventionally produced oil. What’s more, if the tar sands industry continues to grow for the next 5 years, Canada’s permafrost will melt, releasing even more methane into the atmosphere. Climate scientist James Hansen claims tar sands extraction would be “game over” for the climate. The KXL pipeline would the bring oil extracted from the tar sands in Alberta Canada down to oil refineries in Texas, by a path that would traverse over crucial aquifers and farmlands in the Great Plains. The extraction itself would require destruction of boreal forest in Northern Canada, in an area larger than the state of Florida. If you couldn’t make the rally, DC EcoWomen has your back! Stay tuned for a photo slideshow from photographer extraordinaire Marine Jaouen. The following is a guest post by DC Ecowomen Board Member Programs VP Jen Howard. I have been struggling with these questions for a long time so I was really excited about attending DC EcoWomen’s “Overfed Yet Undernourished” workshop last Thursday. Drs. Threlkel and Windsor from the Restorative Health Center for Integrated Medicine walked us through common deficiencies and then demonstrated some easy recipes that focus on getting those vitamins and minerals back into our diet. Their goal was to teach us how to listen to our bodies, realize what we need, and find healthy alternatives to the greasy egg and cheese biscuit. 1) Almost everyone is deficient in vitamin D and even if we all lived in the tropics and played beach volleyball every afternoon in our bikinis we would still not get enough. 2) Sugar is a drug. Anyone that has tried to give up sweets or go carb free knows this in their hearts but it is nice to have professional validation. 3) There is basically a mineral war going on in your body all the time. Calcium, magnesium, and folate work together and against each other (in a very complicated molecular biology, organic chemistry kinda way) to trick your body into absorbing more minerals. Once the balance of power shifts in any one direction the other two suffer. 4) Magnesium helps relax muscles, lowers blood pressure, and reduces PMS cramps. It is also found in dark chocolate hence the chocolate carvings that hit once a month. In general cravings are signals that your body needs something. If you aren’t listening carefully enough to your body you might overeat trying to satisfy it without realizing what it wants. Listening to your body is a skill that takes practice so next time you have the munchies for no reason take a few minutes to figure out what exactly your body is saying to you. 5) You can make chocolate brownies healthier by substituting black beans for the oil and eggs. WHAT!!!!! Mind blown. Like I said at the beginning, nutrition is a personal choice and one I am sure I will continue to struggle with. However, Drs. Threlkel and Windsor helped me have a greater understanding of how the food I eat influences how I feel on a day to day basis, how to think about my food cravings and determine what my body is really asking for and find healthy substitutes, that no one diet is right for everyone, and my husband may never be an adventurous eater but I can trick him into eating leafy green vegetables using a juicer! If you’re interested in reading more about women’s health and nutrition, check out our blog post on Malnutrition in American Women or check out our resource page on Healthy Communities. On Saturday, February 2nd, “Potomac Phil” – the D.C. local stuffed groundhog – emerged in Dupont Circle to look for his shadow. He searched, but did not find – giving us an early end to winter, and a premature spring. But how can there be an early spring if there was no winter? 2012 was the warmest year in Washington DC since temperatures were first recorded in 1871. This included a record-breaking heat wave, an unprecedented hurricane-force storm, and an uncommonly warm winter. The year 2012 averaged 1.3 degrees Fahrenheit warmer than the previous warmest year – not an insignificant difference. Did Phil consider that before he roamed around Dupont, shadow-free and carefree? Maybe Potomac Phil went into an early hibernation when Hurricane Sandy came through. Hopefully, the tropical storm force winds didn’t blow away his home. Maybe he noticed the premature budding of cherry blossoms last week, or heard the mosquitos buzzing around in the 70-degree weather. Possibly, he heard of the predicted boom in stink bugs this upcoming spring. This being Washington, Potomac Phil also made political predictions. And he predicted “six more weeks/months of political gridlock.” Thanks, Phil. With the political gridlock, the possibility of passing climate change legislation is even more unlikely – meaning warm winters and early springs may become more common. Will Potomac Phil ever see his shadow again? What will happen if Groundhog’s Day becomes inconsequential – will Phil wither away into irrelevancy? But after all, Potomac Phil is just a stuffed version of his Philadelphian-native brother, “Punxsutawney Phil.” He doesn’t have to worry too much about the effects of climate change. For the rest of Washington, his prediction is disquieting. This is where the DC EcoWomen come in. How will the Groundhog’s Day prediction affect your consumer habits?